Accumulation of many thousands of CDS postmarks from various States and periods in 7 binders. 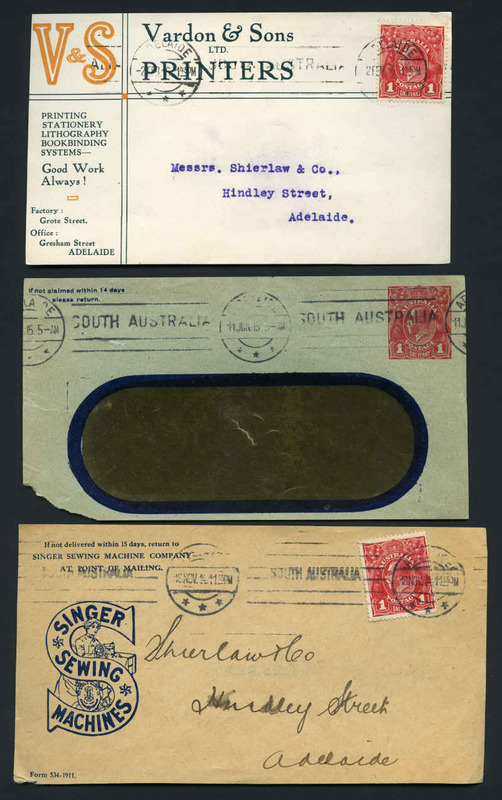 Selection of 28 mainly South Australian Company advertising cover fronts from 1904 to 1921 mainly stamped with KGV issues. 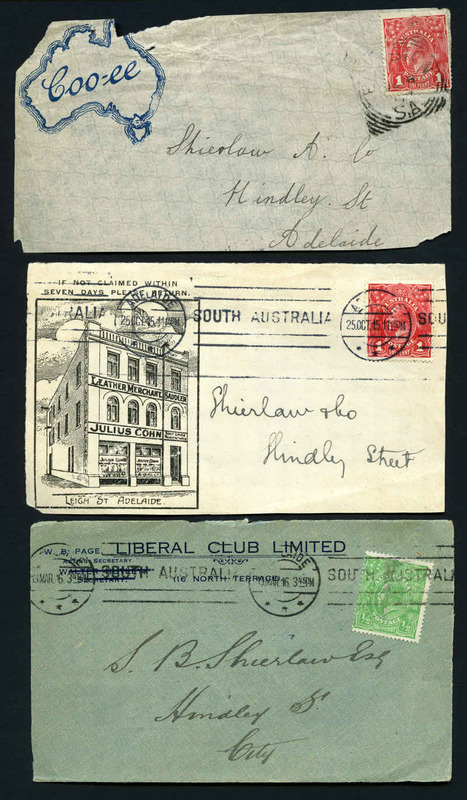 Includes South Australian Caledonian Society franked with 2 ½d Green KGV, one with White flaw in right side of crown variety, F.H. 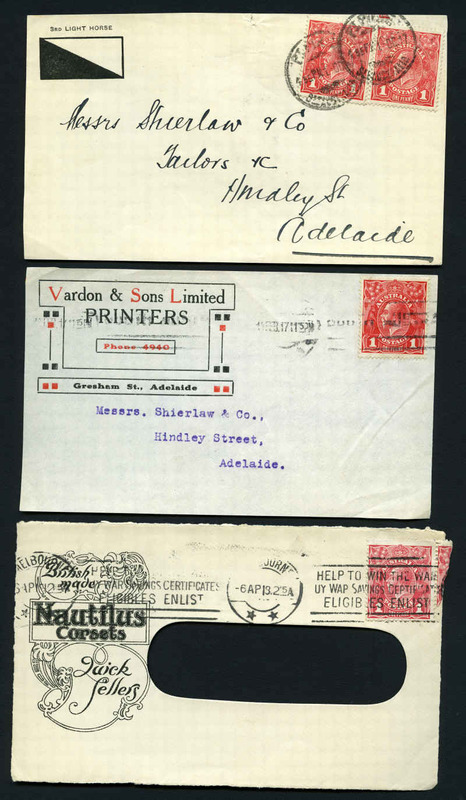 Faulding & Co, Ibis Footwear Limited, Vardon's & Sons Ltd, W.M. Shakespeare & Co, Bedggood & Co, 3rd Light Horse and Barnet Glass Rubber Co Ltd. 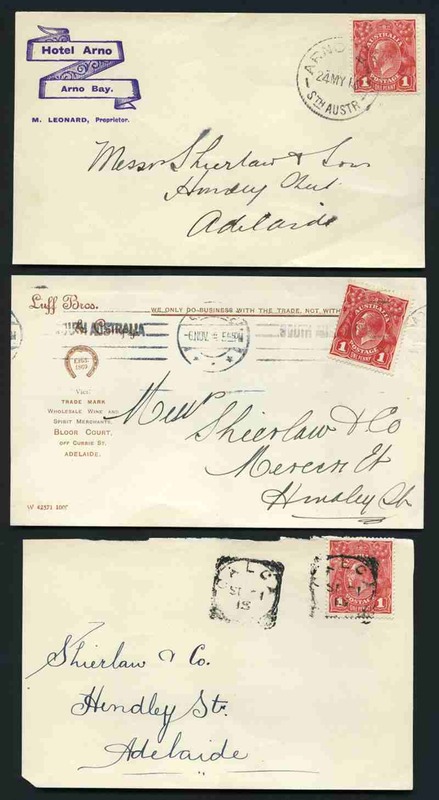 Selection of 17 cover fronts stamped with 1d Red KGV issues including Die II (7), varieties, company slogans and range of squared circle cancellations. 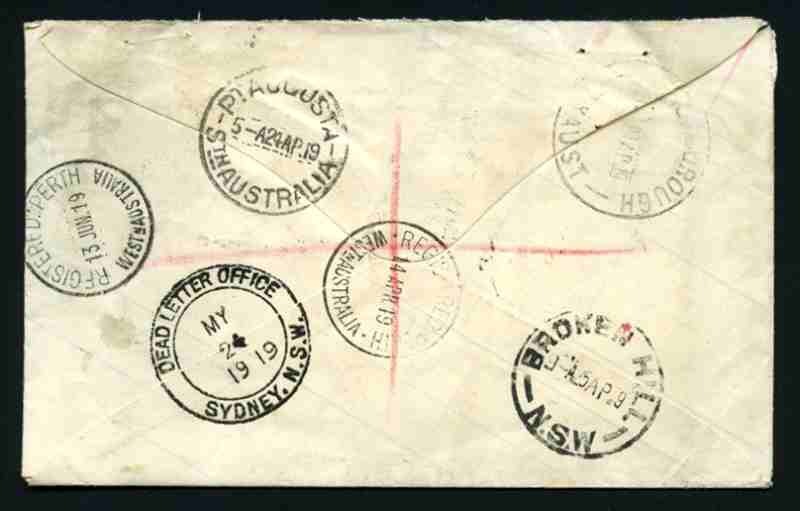 Noted Dot before right "1", "Secret Mark", "RA" of "Australia" joined and "NY" joined varieties, Large Mult Wmk Harrison Printing, plus pair on piece with Goode, Durrant & Co Adelaide perfin and Calca, Charra, Hoyleton 27½mm, Mount Cooper, Utera, Warrow, William Creek and Yongala South Australian squared circle cancellations. 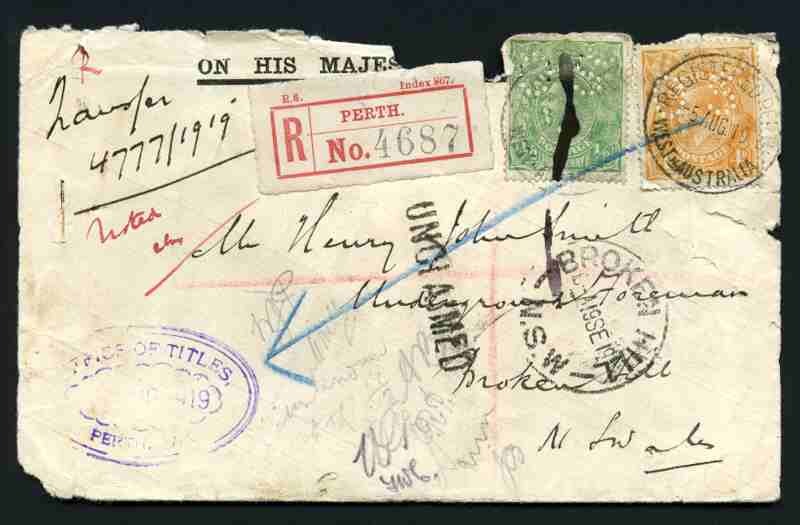 1919 OHMS registered commercial cover from Perth, addressed to Mr Peter Francis Hogan/Labourer/Broken Hill/NSW, franked with ½d Green and 4d Orange perforated OS Single Wmk KGV tied by Registered Perth, 14 APR 19 Westn Australia C.D.S. with dual red Perth registration labels. 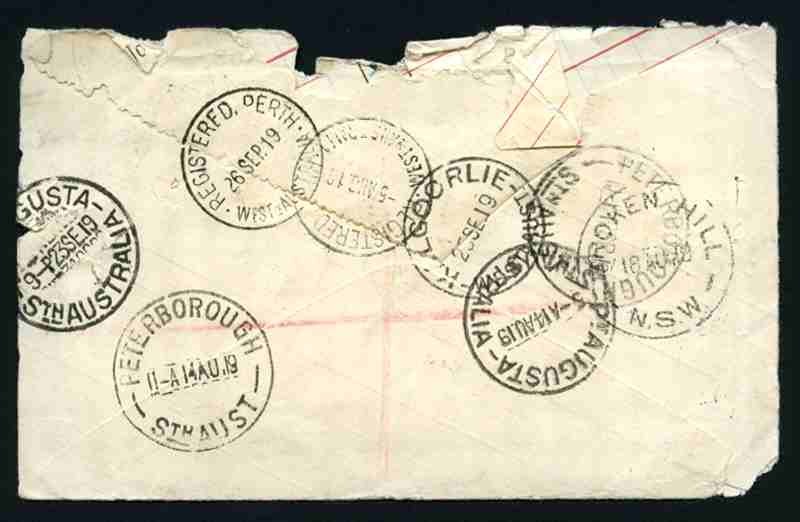 Also similar tatty cover addressed to Mr Henry John Smith/Underground Foreman/Broken Hill/NSW. 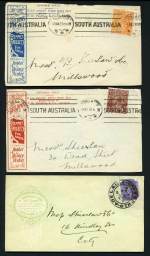 Both covers well travelled with Office of Titles, Perth WA oval cachet and a range of postal markings. 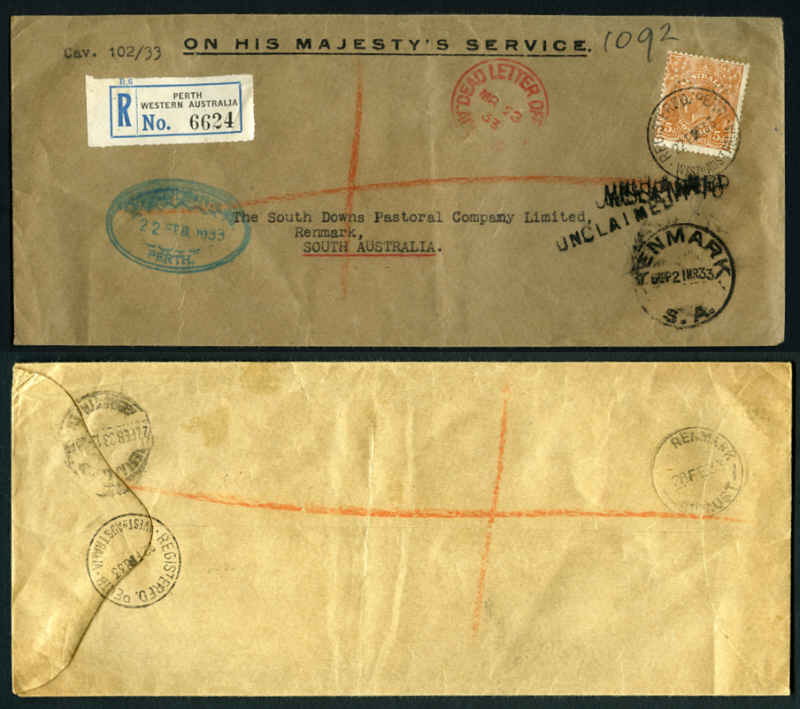 Interestingly both envelopes have On His Majesty's Service printed on them, but have been produced from recycled ledgers, obviously a WWI paper conservation measure. 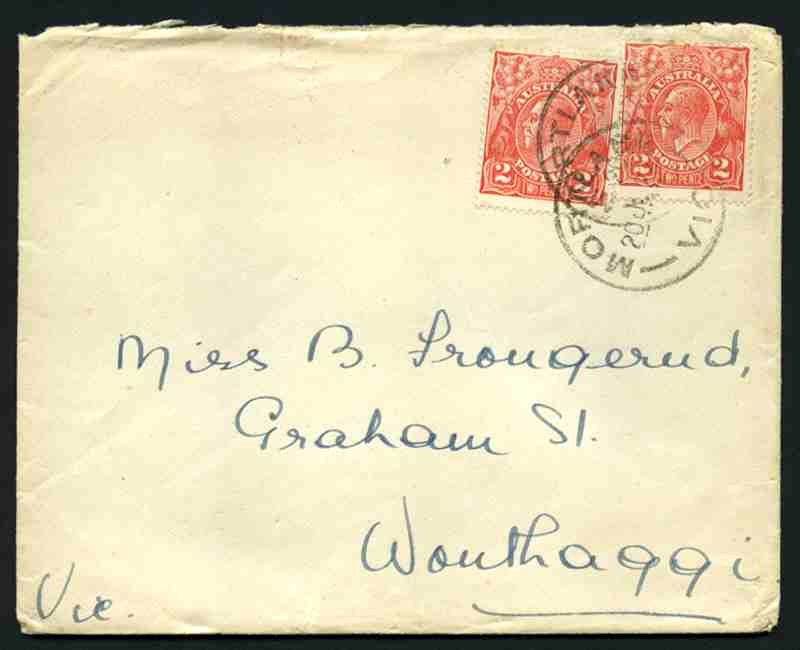 1922 double rate cover to Wonthaggi, Victoria franked with two 2d Red Single Wmk KGV, one with Retouched ("Roman") nose variety, tied by Mortlake, 20 JE 22 Vic C.D.S. cancellations. Remarkably good condition. 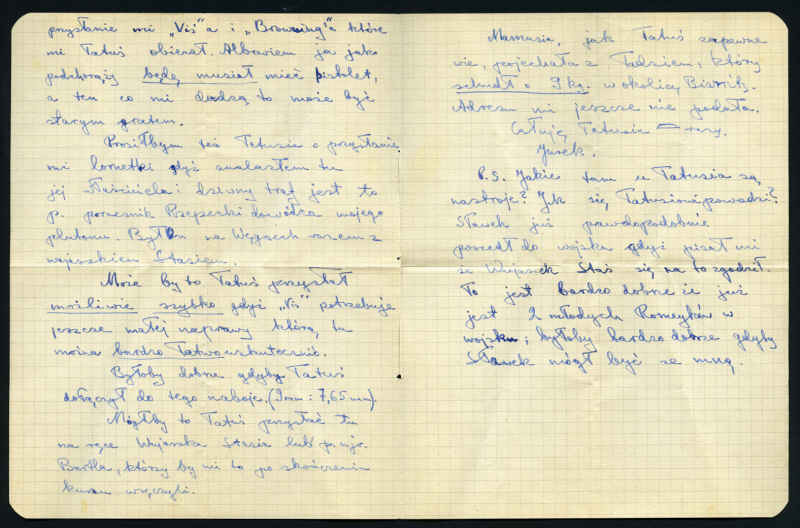 ACSC 96(11)i. Selection of 198 commercial covers stamped with 1d Green KGV issue, mostly Small Multiple and C of A Wmk including range of advertising covers. Noted Single Wmk Dot before right "1" variety, Small Multiple Wmk perf 13½ Die II merged (2 covers), "Penavy" variety, perforated OS on OHMS cover, plus cover with attractive Come To The West! Western Australia's Centenary label and C of A Wmk "NY" joined variety. Condition varies, but generally fine. 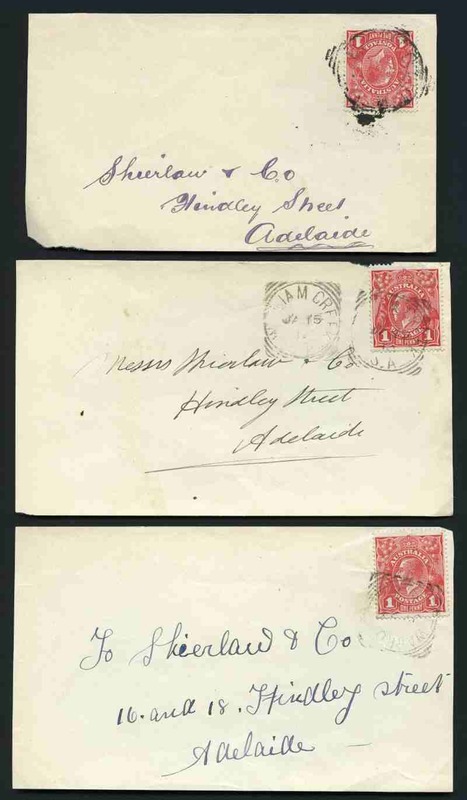 Selection of 51 commercial covers stamped with 1½d Red Small Multiple Wmk KGV issue including a range of minor varieties and advertising covers. 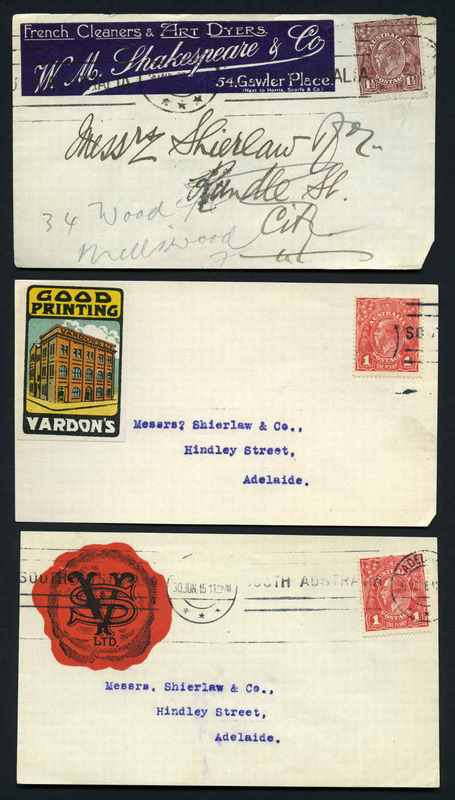 Noted Broken top to crown variety and W&Co/A [Wilkinson & Co Limited] perfin on advertising cover. Condition varies, but generally fine. 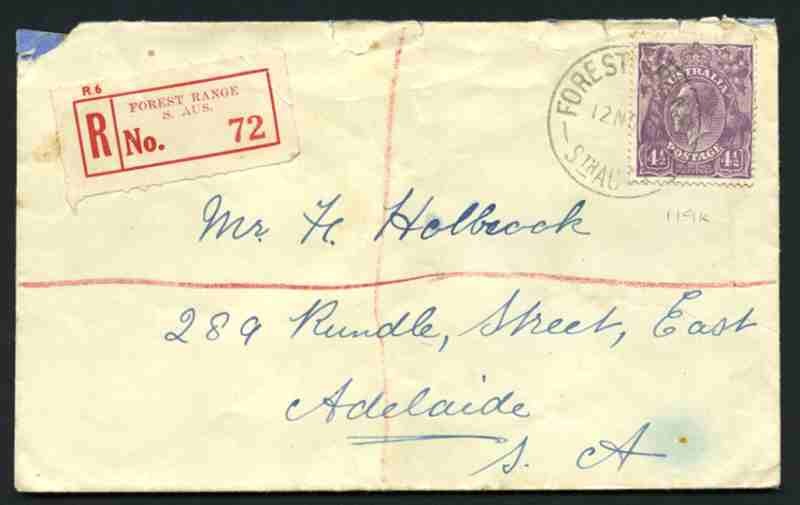 1928 registered commercial cover franked with 4½d Violet Small Multiple Wmk perf 14 KGV with White flaws on "A" and "E" of "Postage" variety, tied by Forest Range, 12 NO 28 Sth Aust C.D.S. 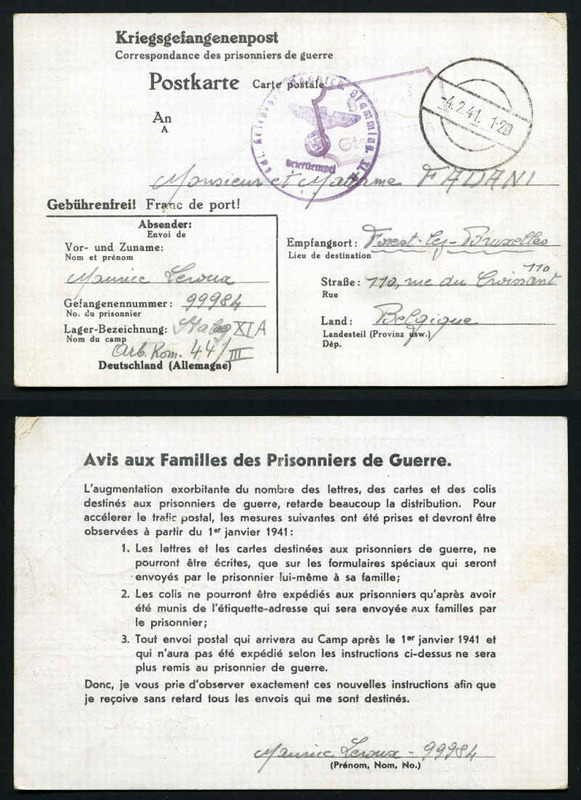 cancellation with red Forest Range registration label. ACSC 119k. 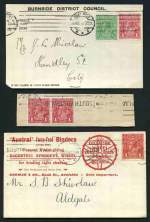 Selection of 62 commercial covers stamped with 2d Scarlet KGV issue, mostly C of A Wmk including range of minor varieties and advertising covers. Noted British Wireless Marine Service Ocean-Poste cover with telegraph and cover with attractive Victorian & Melbourne Centenary label. Condition varies, but generally fine. 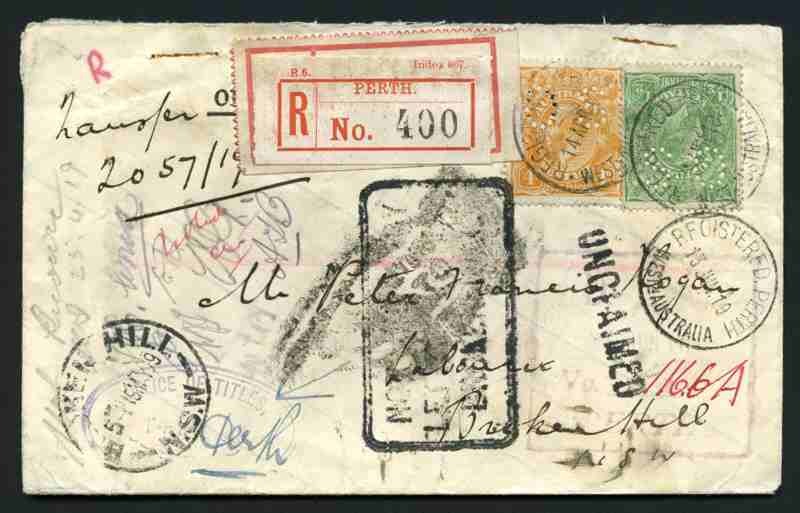 1933 OHMS registered commercial cover from Perth to Renmark, franked with 5d Brown Perforated OS Small Multiple Wmk perf 13½ KGV, tied by Registered Perth 22 FEB 33 Westn Australia CDS with Office of Titles, Perth WA oval cachet and a range of postal markings. Selection of 58 mostly plain covers from 1931 to 1959 including First Day covers, Censor cover, 3 First Flight and 2 underpaid covers with some duplication. 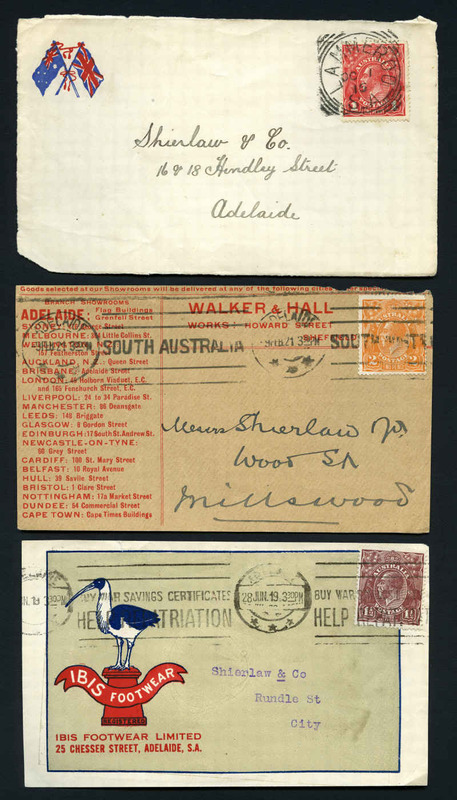 Noted 1931 First Flight from Melbourne to Hobart with special cachet, 1937 3d Blue Die I KGVI on plain FDC, 1938 9d perf 13½ Platypus on attractive illustrated registered FDC (2) and 3 registered covers stamped with 1945 Gloucester issue cancelled FDI R.A.A.F. 8501. Condition varies. 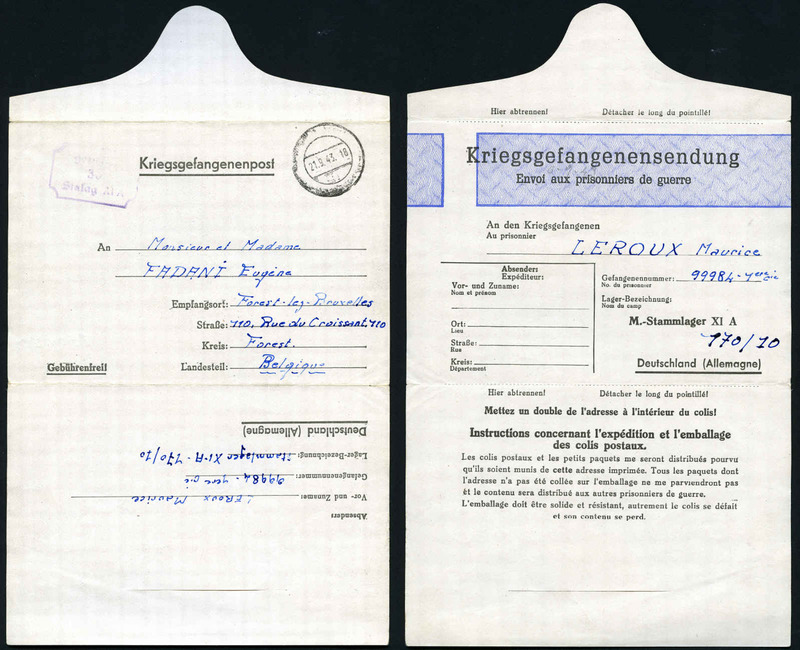 Selection of 7 WWII censor covers, plus soldier's Record of Service Book, Demobilization Procedure Book and Certificate of Discharge, as well as a few other covers. 1941 P.O.W. 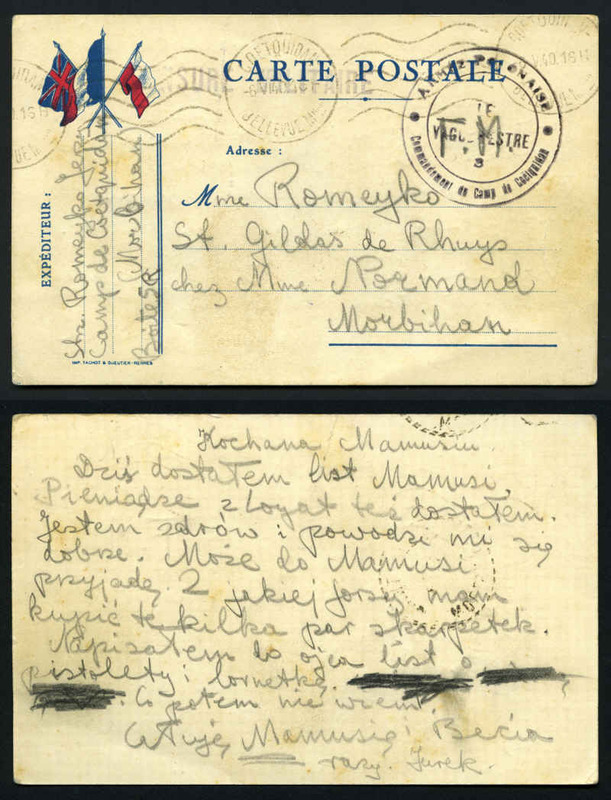 Postcard and 1843 P.O.W. 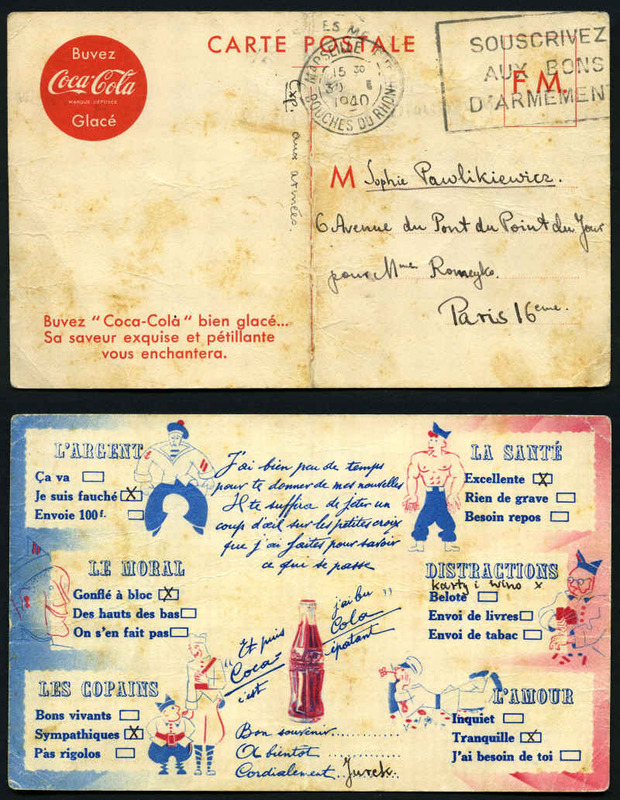 Lettersheet sent from Stalag XIA sent to Belgium, 1940 French Postcard sent from Coetquidan Camp, Scarce 1940 French Coca Cola advertising cards with some faults sent from Marseille to Paris as well as a letter from the same French correspondence. Selection of 102 First Day Covers, souvenir covers, postal stationary and miscellaneous items from 1931 to 1993 including 4 WWII censor covers, one postmarked Daly Waters N.T., 1960 5d Blue QEII Newspaper Wrapper unfolded mint (11), AAT 1961 2/3 Penguin block of 4 FU on WCS cover, 1970 Cook set on small official addressed FDC and 1988 Qantas Opera in the Outback souvenir cover flown by Royal Flying Doctor Service and signed by Dame Keri Te Kanawa. Also early Great Britain political postcard Out For Victory. The Bomber. Back him up by throwing in a War Bond by artist L.Raven Hill. Odd fault. 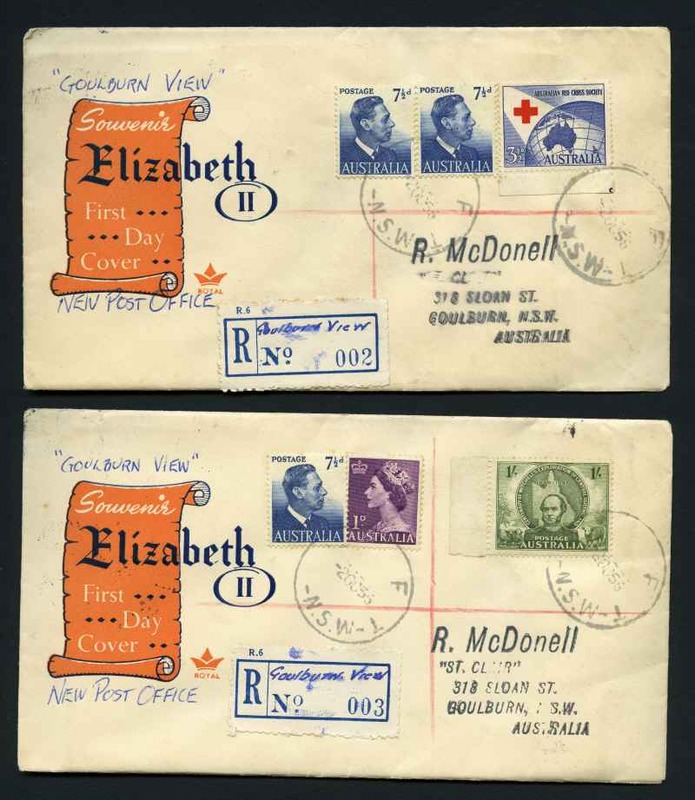 1956 Royal cover cancelled on the opening day of Goulburn View N.S.W. Post Office (3) with provisional Goulburn View No 2, 3 and 4 Registration labels, plus 3 unregistered covers. Stamps are cancelled with F T N.S.W. cut down Relief postmarks. 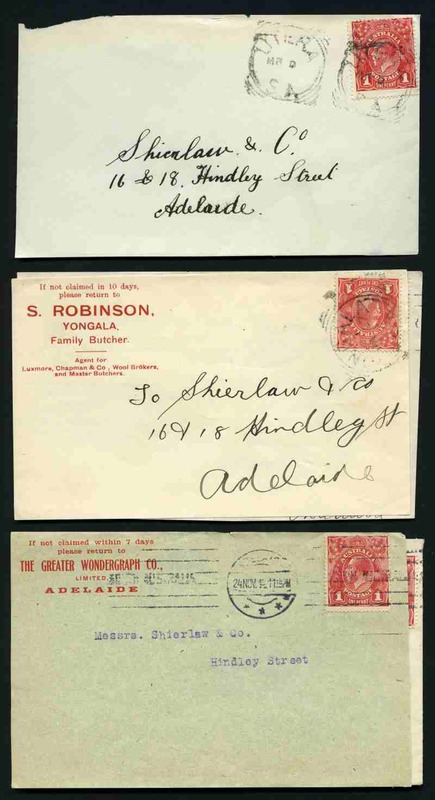 Registered covers with Goulburn and additional Relief backstamps. 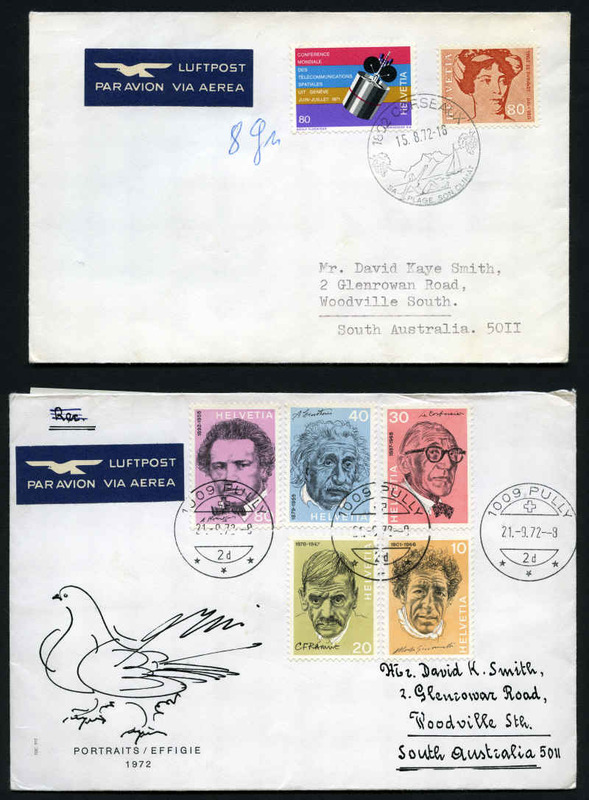 Accumulation of 389 official FDC's and special postmark covers from 1966 to 1987, plus few Foreign covers, two well travelled redirected articles and 1982 Blue postcard pack (2). 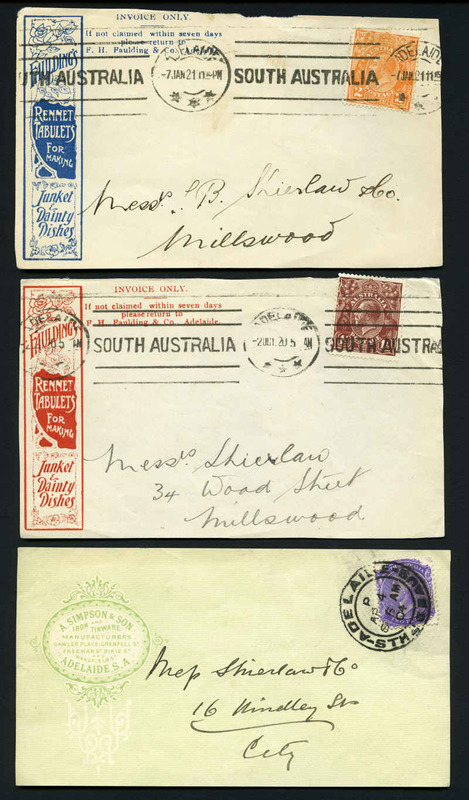 Includes some early Australia Post logo covers and useful range of pictorial postmarks. Some plain covers and duplication. Accumulation of thousands of Priority Paid commercial covers and cut outs, mainly from the 1980's with a variety of frankings used and a wide range of Priority Paid postal markings and some registered covers. Collection of 1,025 Frama label covers from 1984 to 1995 including a very large range of cliche numbers, Certified and Priority Paid covers, Button sets and other special usages. Noted 1990 41¢ Frill-Necked Lizard with machine impression on gummed side on cover dated 30 AUG 1990 [ACSC states at least two covers are recorded of this error], plus several zero and blank labels. Face Value $737.84. 1993-95 Threatened Species and Kangaroos and Koala counter printed stamps collection of 365 covers and 51 Aerogrammes comprising a range of values to $12.50 including numerous literal sets and some duplication. Face Value $760.05. 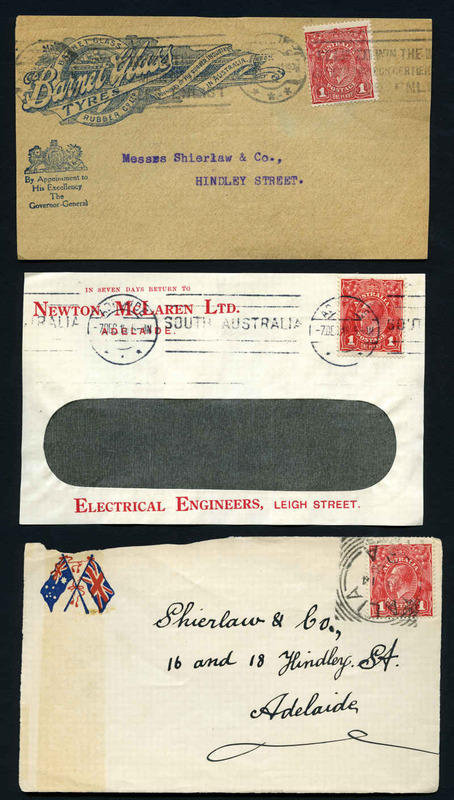 Accumulation of 698 Covers and Postal Stationery items from the 1930's to modern including First Day Covers, Special Postmarks, Aerogrammes, Maximum Cards and Pre-Stamped Envelopes with some New Zealand and Foreign content. Noted 1966 Definitive set of 24 on WCS FDC's. Varied condition with main strength in 1970's and 1980's period. Also 1976 Red, 1978 Blue and 1981 Brown Postcard packs and bundle of modern picture postcards. Accumulation of 608 Covers, Postal Stationery and miscellaneous items mainly from 1950 to 1988 including First Day Covers Special Postmarks, Aerogrammes, Maximum Cards, Pre-Stamped Envelopes, Stamp Collector Cards and some Foreign. Includes numerous handy items in good condition. Also 1976 Red, 1978 Blue, 1981 Brown (3) and 1982 Black (2) Postcard packs. Selection of 10 Tin Can mail covers from 1937 to 1945 including one registered cover. Many interesting cachets and postal markings. Odd minor fault. Selection of 15 commercial and philatelic covers from 1946-1998 including some special postmarks. 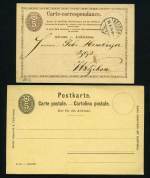 Also 2 different 1874 5c Post cards, one mint and one used. 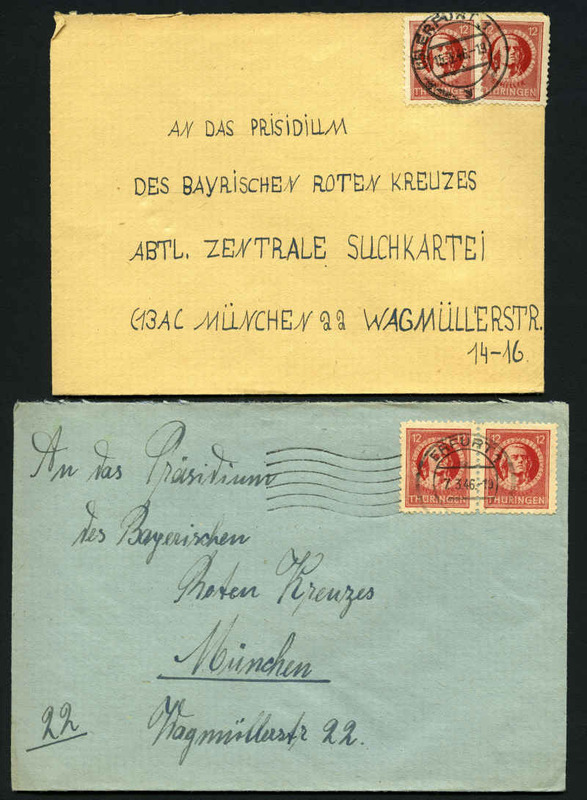 1946 Cover stamped with two or four 6pf Green Posthorn issue (9) and 1946 Cover stamped with two 12pf Red Schiller issue (12), both addressed to Munich with range of interesting postmarks. 21 covers. 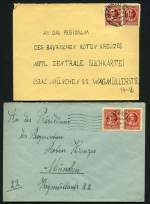 1946 Cover stamped with two 12pf Red Schiller issue addressed to Munich with range of interesting postmarks. 20 covers. 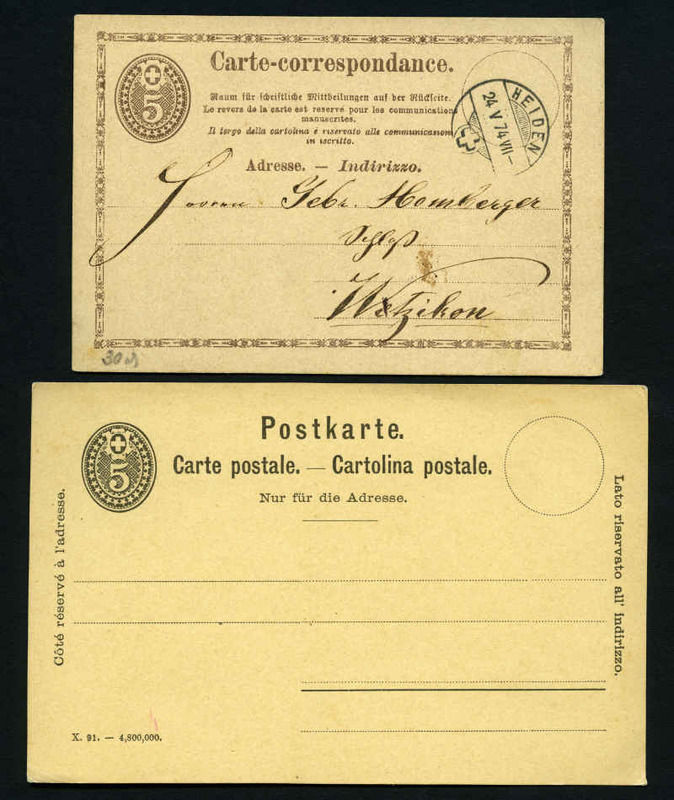 Selection of 384 covers or postal stationery items from 1870 to 1995 comprising mostly Commercial covers, First Day Covers, Airmail covers, Censor covers, Postcards and Embossed Envelopes. 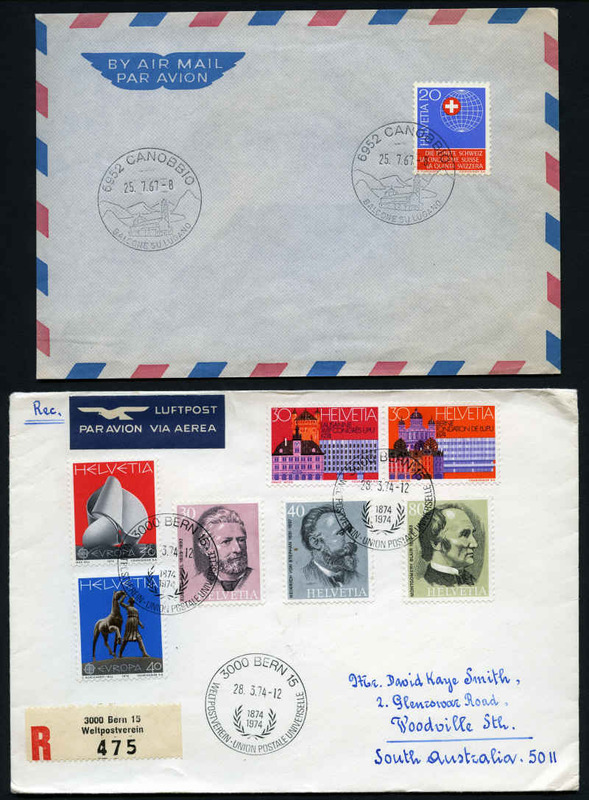 Interesting range of early Airmail covers from the U.S.A. including some internal covers with various cachet's. Noted 1925 U.S.S. "Los Angeles" Zeppelin Flight cover from New York to Hamilton, Bermuda and 1936 First North American Zeppelin return Flight cover from New York to Frankfurt. Odd fault, but generally fine condition. Selection of 80 mostly different WWII Patriotic Covers from 1938 to 1950 with interesting range of attractive Captions, some Cinderella labels and few Censor covers. 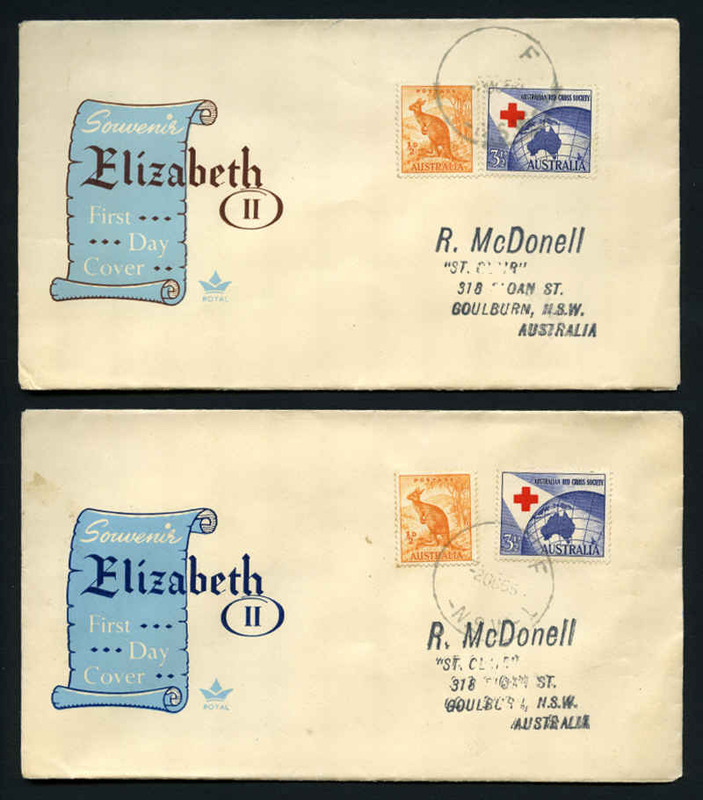 Accumulation of 778 First Day and commercial covers from 1940 to 1990's including some Censor covers with main strength in Australia, Great Britain, Papua New Guinea and New Zealand. 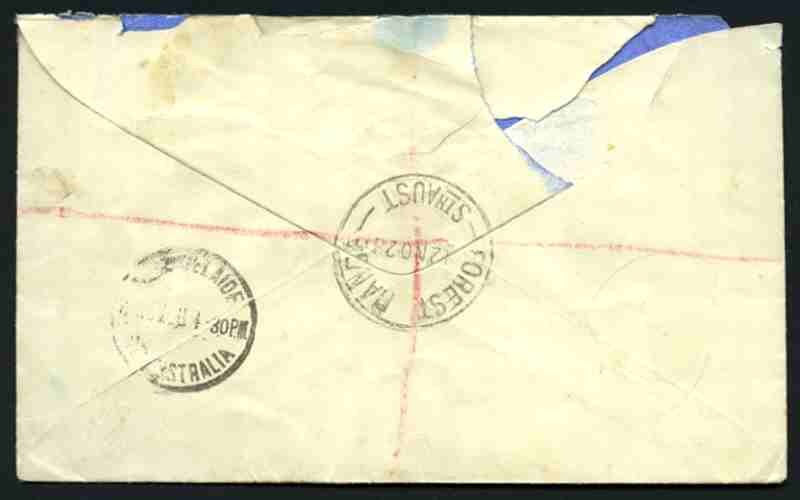 Noted 1940 cover to France opened by examiner with Non Transmissible straight line and Return to Sender postal markings, 37 covers from Papua New Guinea, mostly stamped with Australia 1952 6½d KGVI issue, 1940 cover from Pitcairn Island franked with New Zealand stamps tied by 14 OC 40, Last Day postmark of New Zealand postal administration, 2 New Zealand Express Delivery covers, one postmarked Burnham Military Camp and the other Narrow Creek Military Camp, Great Britain 1957 Scout Jamboree set on illustrated FDC (3) and range of New Zealand special postmarks. Also selection of mint stamps including range of Great Britain presentation packs (FV $60.00) and New Zealand 1d Admiral on piece and part cover tied by Marine Post Office R.M.M.S. 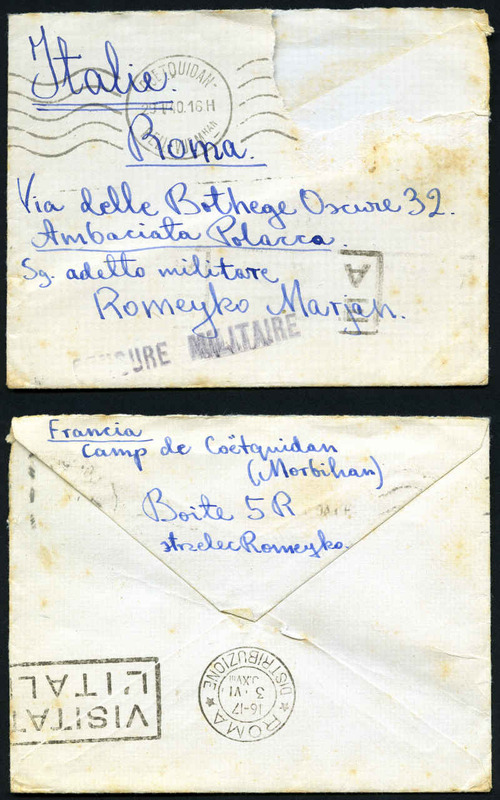 Aorangi CDS postmark. Varied condition. 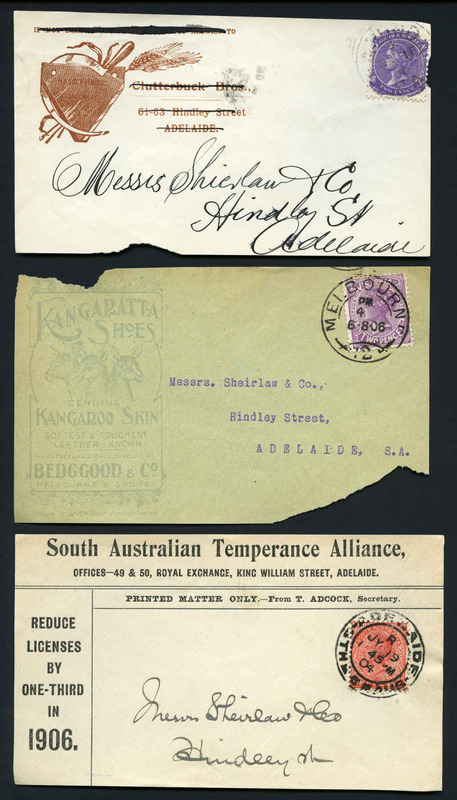 Accumulation of hundreds of covers and postal stationery items from a range of countries and periods with strength in Australia including FDC's, PSE's and postcards. 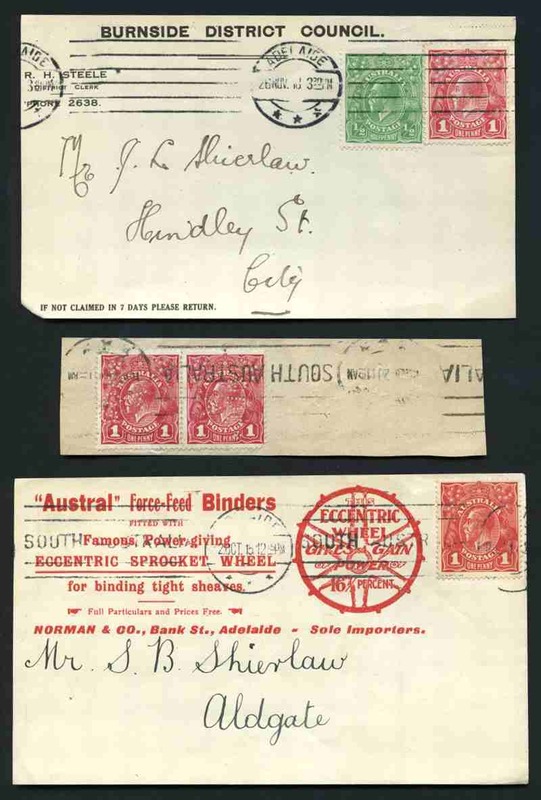 Accumulation of hundreds of covers, postal stationery and miscellaneous items with main strength in Australian FDC's and PSE's including some special postmarks. Noted 1978 $20.00 Departure Tax stamp tied by 1986 Immigration & Ethnic Affairs, Adelaide cancellation to the cover of an Airline Ticket (2) and 1993-94 $10.00 Wood Duck Australian National Parks Wetlands Conservation M/S MUH (5). 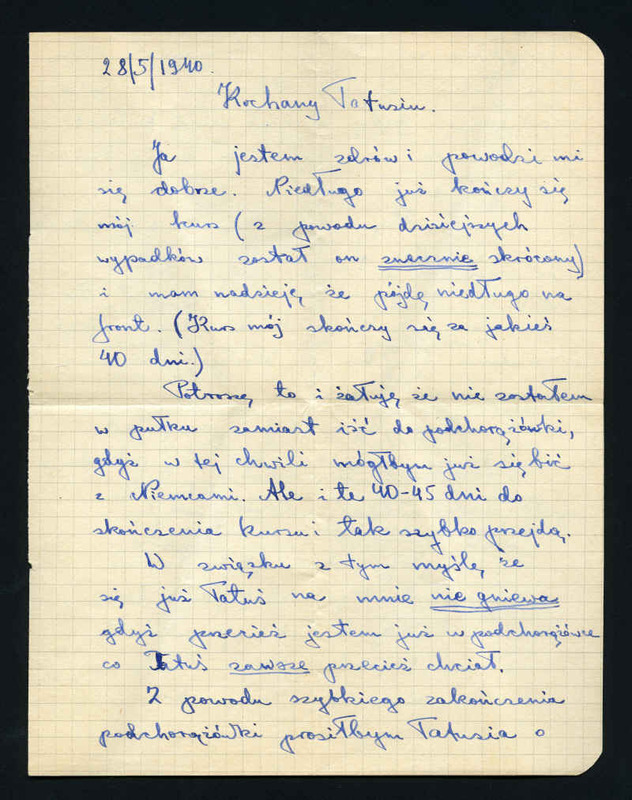 Accumulation of 1,012 commercial covers, postcards, First Day Covers, postal stationery and miscellaneous items from a range of countries and periods. Main strength in Australia and Latvia. 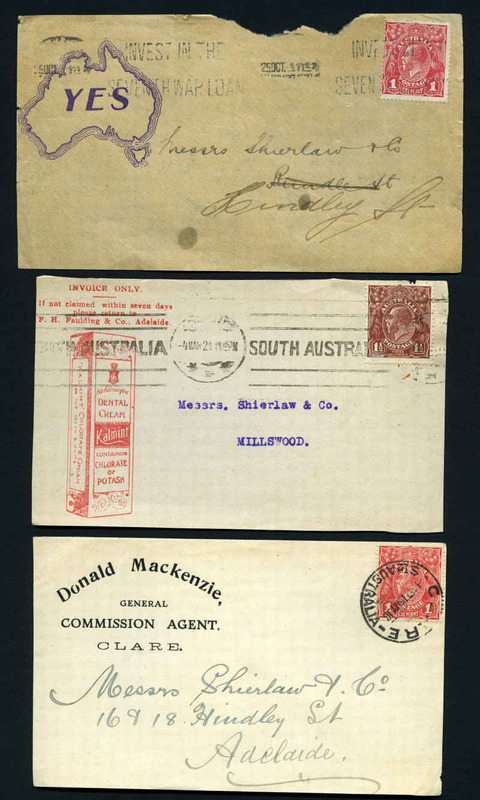 Accumulation of 1,578 covers, postal stationery and miscellaneous items from a range of periods and countries including Commercial covers, First Day Covers, Registered and Certified covers, Underpaid covers, Special Postmarks, Postcards and more. Main strength in Australia, Great Britain and USA. Condition varies. 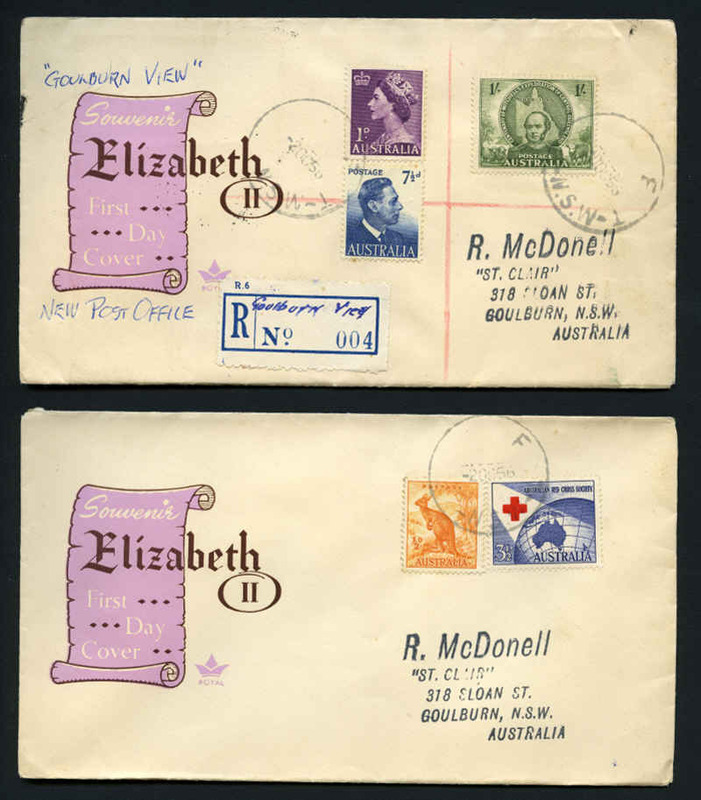 Accumulation of 476 First Day Covers, First Flight covers, special postmarks and miscellaneous items from 1932 to 1985 with main strength in Australia. 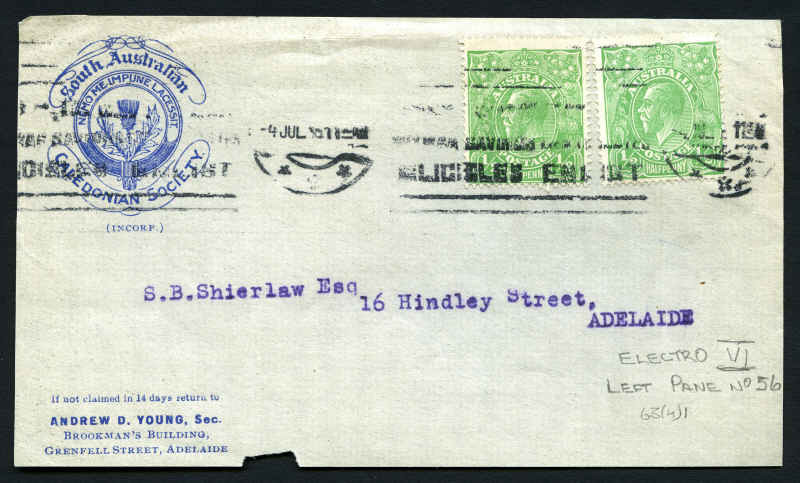 Noted 1932 2d and 3d Engraved and 2d Typo Sydney Bridge on registered cover cancelled with Sydney Harbour Bridge NE Pylon 19 MR 32 CDS postmarks, 1934 New Zealand to Australia First Flight cover franked with 7d Trans-Tasman Airmail issue, 1955 Singapore to Australia FDC franked with 1955 QEII Definitive set and other handy items. Condition varies. 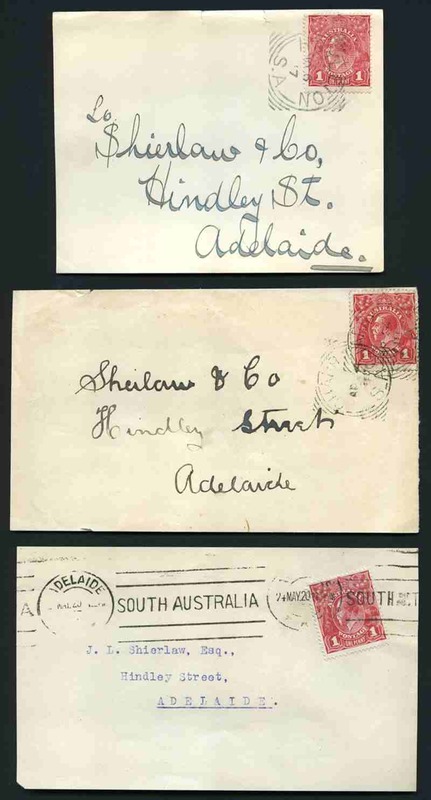 Accumulation of many hundreds of covers and miscellaneous items including Commercial covers, First Days Covers, Postal Stationery items, Post Cards, Forces Mail items, Registered covers, special postmarks and more from a range of countries and periods in large carton. Condition varies.